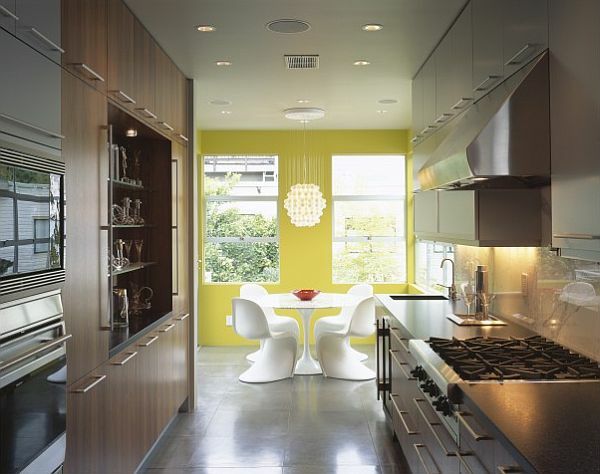 Sand down those cabinets until your hand meets a smooth texture, and splash on bright yellow paint. 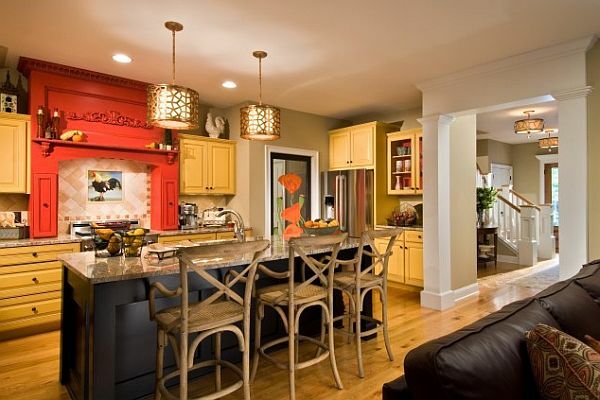 This is just one of the ways you can brighten your home with the zest and power of lemons starting with your kitchen. Because sometimes life gets too hard and too heavy. The burdens of tomorrow’s tomorrow on our shoulder before today’s are gone. And with all the noise and clamor it’s hard to feel, sense or remember quiet calming normalcy. It’s times like these I revert to the days of my childhood and find myself laying flat on my back in the great outdoors known as God’s canvas. I cup my hands around my eyes so I can see the never-ending expanse of the sky, and only the sky. The star of this stage of course is the supremely matchless sun and its shine. The sun is our friend year round and supplies us with Vitamin D and spreads its love on our other living-breathing inhabitants upon earth as well, from slimy snails to the dessert roses. Mustard, buttercream, even the modern chartreuse, yellow is a color full of vitality as it stimulates our eyes with warmth, friendship, hope, optimism and courage. These thoughts and sensations brought into our home in a more permanent way can encourage us to do better, work harder and live longer. 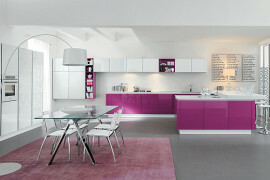 So with inspiration like that let’s incorporate this color in our kitchen in five fun versatile ways! We began this discussion with the declaration of sanding and repainting the cabinets. 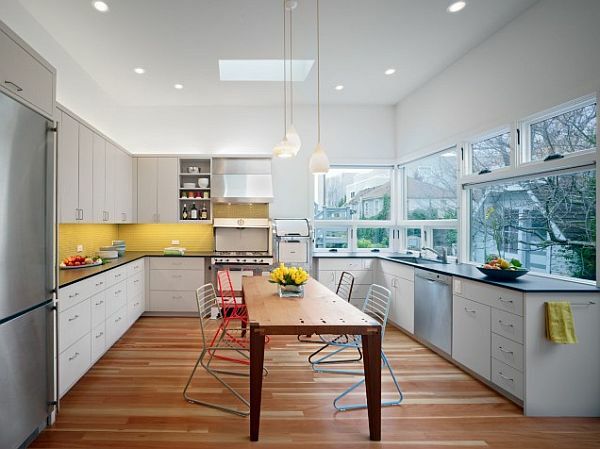 Let’s continue this discourse with how you can spice up your kitchen with sunshine. 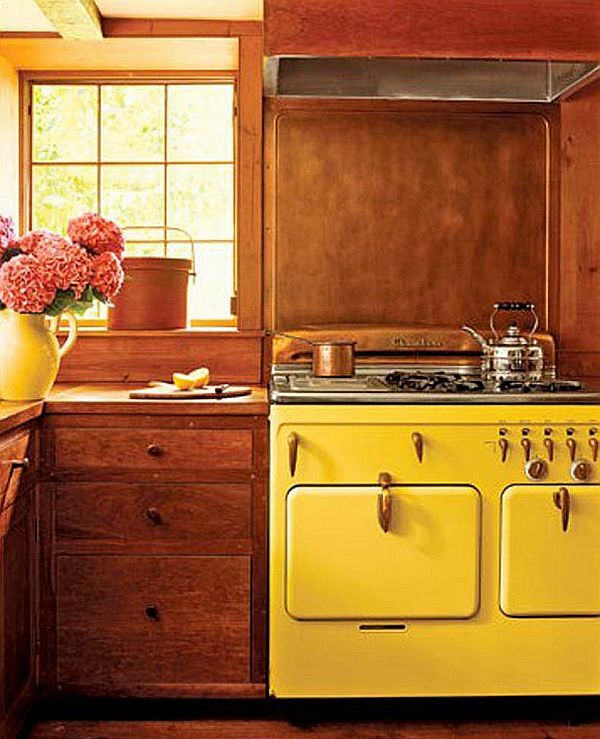 A creative approach to this is painting your base cabinets cream or white, and present your yellow on your cabinet and drawer doors. Finish the look with some bronze or chrome nobs and it’s on to the next section of the kitchen so we can style the sad jaundice into smiley face yellow. 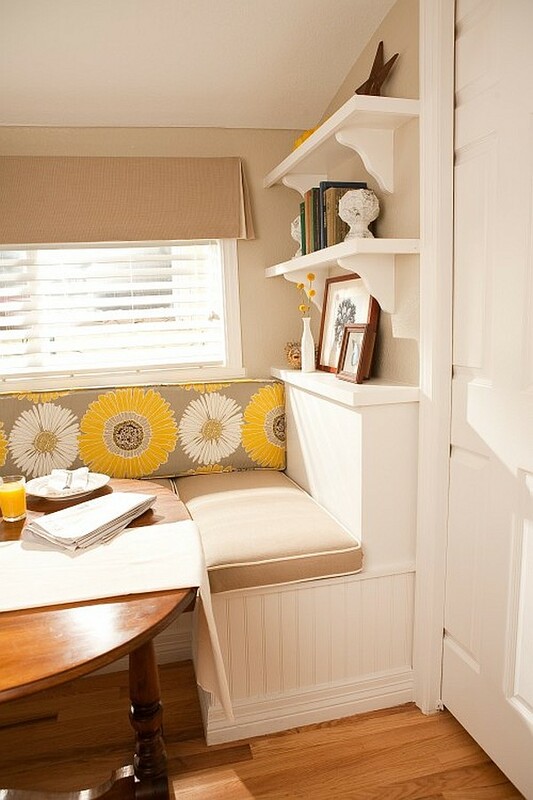 It’s a shame that the sitting nooks in kitchens have been designated to be used for breakfast if even that. Sometimes they are the architectural element of the house that doesn’t get used, just looks good, with all the linens and place settings staged to look perfect and inviting, but not to be touched. With stripes, flora and fauna and lots of yellow we can make the focal point of the kitchen the nook that come breakfast, lunch, dinner and tea time we find ourselves sitting up to the table. 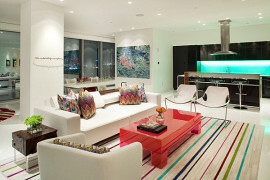 With lots of color in this section of the room you will naturally draw the eye and your legs will follow suit carrying you to sit upon graphic fabric that harmonizes with a geometric rug. Breezy curtains and yellow accented walls compared to the other white walls in your kitchen and your nook expands in size. Everything in your kitchen seems sterile and entirely utilitarian. No frills. No additions of tame much less adventurous colors or unnecessary lines. 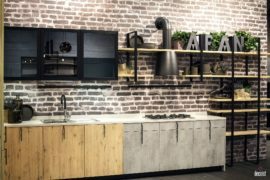 But with some backsplash you can bring yellow into your future by installing a backsplash panel behind your sink and stove top workspace. 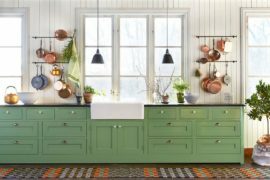 The color enhances while still keeping your new tiles purposeful, as they can be a nice deterrent against cleaning up grease and wayward food. 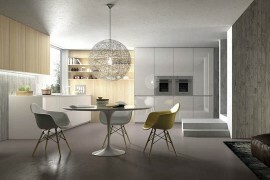 The great thing about yellow is that contrary to our inner color wheel; it harmonizes well with other colors. Orange, black, white, blue, green, you can bring any room alive when you start blending your sunshine yellow in with your pre-existing colors. I recently saw an online post that read, “If I had a British accent I’d never shut up.” I strongly had to agree with this punch line, but sadly even without the accent I never shut up. That’s what you need in a kitchen. Accent furniture that never shuts up and whose accent is always compelling and speaks kindly to all who happen to sit, stand or look upon. 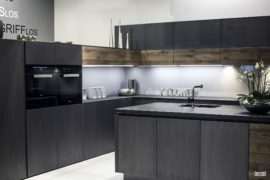 If you have basic white walls, countertop and cabinets, you can allow your kitchen to blossom without having to tear down anything. 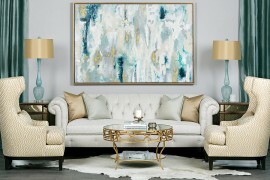 Bringing in some funky yellow bar stools, valances, linen tablecloths and a big comfy overstuffed chair whose tone clearly speaks yellow, these can charm your dull, or just same old room into a sparkly room that has an accent easy on the ears, uh, eyes. 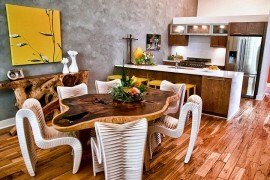 So with these fun interior pursuits, you don’t have to let rainy days wear you down anymore. Come home even at midnight to the sun shining brightly in your kitchen and bask in the joyful goodness yellow longs to offer you.